The Internet of Things (IoT) is one of technology’s most promising new frontiers. It refers to a network of physical devices—be they vehicles, home appliances, or other digital items—which connect to one another to collect and exchange data. The uses of this technology, both for individuals and in industry, are manifold, and combine to make IoT jobs a highly sought-after area of tech employment. Luckily, IE Business School in Spain is helping its students stand out to high tech employers through a combination of industry exposure and high-quality careers coaching. For Dimitrios Spiliopoulos, the MBA was an essential step on the path to changing his career. Dimitrios had previously worked in exports business development across a number of industries and countries—working in his native Greece as well as India and Cyprus—but he was itching for a role with a steeper learning curve. He did his research and saw that an MBA was the best option to help him make the switch—but he had stipulations. Indeed, IE runs a highly successful startup lab which incubates student-run businesses and attracts investors from around Europe. Students can even choose to integrate entrepreneurship into the format of the MBA itself rather than take it simply as an elective, encouraging innovative and problem-solving thinking over the course of the degree. This was Dimitrios’s course of action, and some of his best memories of the course are of his involvement in student activities. Dimitrios and his classmates set out to change this. “We made it very active, [bringing] companies—big multinationals—into the business school to speak to us about strategy and other career opportunities,” he says. As part of the startup lab, Dimitrios co-founded a fast-moving consumer goods company with some classmates, taking responsibility for product proposition, market research and analysis, and market entry strategy—all during his MBA. Being part of the strategy club and startup incubator gave Dimitrios valuable skills that he’s taken forward into his tech career, but they weren’t the only thing that IE Business School did to boost his chances of making a successful career switch. “IE I think gave me many tools that I could use when I was doing my career research,” Dimitrios says. “One was when companies were visiting the business school. I learned many things about different industries, which was very helpful. This certainly seems to have helped. 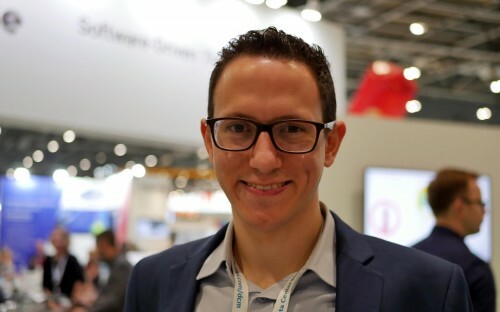 From working in business development as an export executive for Domus building materials in Athens, Dimitrios now works for O2 in the UK as an IoT sales enablement manager, developing new IoT possibilities and strategizing with their commercial, sales, and business development teams. This is worlds away from the construction and manufacturing industry he was working in before. Does he believe that MBAs are useful for people who want to start new careers in tech? Dimitrios explains that MBA grads are well-equipped for management roles in tech companies because they have a cogent understanding of not just their own department, but the business as a whole—and, indeed, the industry at large. From the company’s perspective, he continues, MBAs tend to be more adaptable to change, willing to take risks and innovate. They also have the soft skills that are necessary to succeed in today’s business world—especially in IoT. Dimitrios believes that more MBAs should consider going into IoT—and, particularly, that anyone contemplating a career in tech should consider an MBA at tech-savvy IE Business School.